Its freezing outside and winter colds are doing the rounds. It’s a well know fact ….when your child is ill, his or her sleep will be disturbed by frequent waking and incidentally….so will yours! 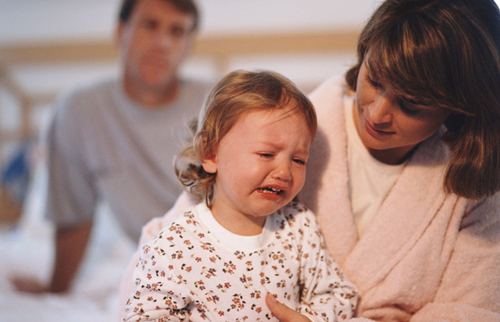 Even children who could sleep for England will be kept awake by a fever, coughing or a blocked nose. Try and keep up your bedtime routine. Having a warm soothing bath helps to relax achy muscles and unblock noses. A warm bath is a great trigger for the production of the sleep hormone melatonin and keeping to your routine will prove invaluable when he recovers and needs to start getting used to “normal” routines again. Don’t worry if your little one is sleeping more at this time, this is nature’s way of helping him fight infection. In fact the illness itself actively increases his need for sleep to help support and stimulate his immune system. Once he is eating and drinking well and seems back to his “old self”, you can go back to your sleep plan. There is usually no need to go right back to the beginning, you should be able to pick up from where you were when he became ill. After about 3 or 4 nights of perseverance and hard work you should be back on track.